Your shelves of canned goods looks so great! I spent the summer processing food as well with a pantry and packed freezer to show for it. Very satisfying…yet I have to admit that I was happy when the last of the fruit trees was empty of fruit and we got a hard frost! I can get back to knitting! Thanks for the links to recipes…some of those sound amazing! Hey Adrian! I’m not a current member, I’m a past member, but I’d like to be added to the waiting list! Thanks! oh my, all that foodstuffs looks amazing. maybe i will get my act together and learn how to preserve fruits & veggies next summer! 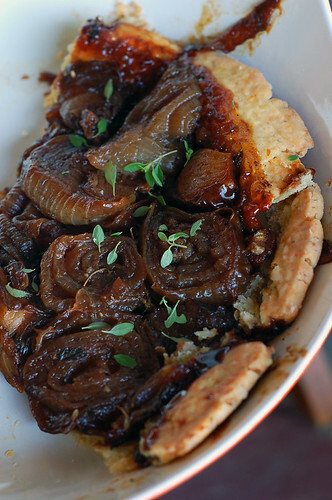 that vidalia onion tarte tatin? must. make. That warm feeling, the canned stuff feeling? I think sometimes I love for that. live. live for that. sigh. And how did you do the pesto? That’s not a high acid food…did you pressure can it? Did you freeze it? Nosy. You *are* ok! All those jars are beautiful–I can’t imagine all the work. Can’t wait to see some knitting! Thanks for the links to the tasty looking dishes….sorry to have not had your company and new recipes this past weekend…..see you at Rhinebeck though! I made that apple cake about a month ago and it was unbelievably good. Well I don’t have such a nice pantry but a shelf in our cellar is stuffed with marmelades and chutneys. Love that stuff! 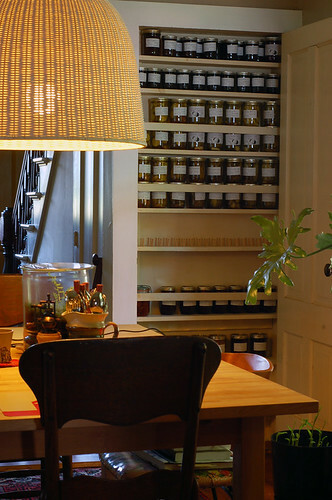 Those shelves of jars look beautiful, but I can only imagine the work that went into them. I can’t wait to see your new sweater at Rhinebeck! Hopefully I’ll run into you there at some point! My first venture to Rhinebeck and I saw all the people on line for the artichokes! I was not one of them and I think I am regretting that…. 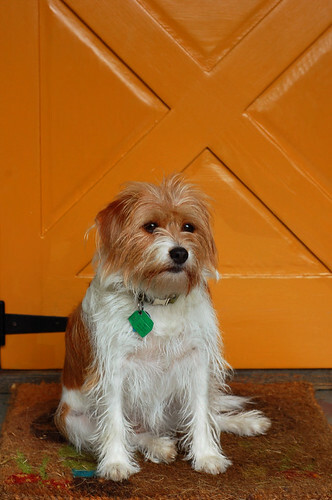 What kind of dog is Pippa? What a cutie!!! Hi! I just found your site, and I was wondering: how can I get on the waiting list? That Vidalia Tarte looks so good! Your link to the Tomato Galette links to the apple cake. Now, I am intrigued about the Tomato Galette! Oh the canning is very exciting! I took a canning class over the summer but haven’t’ been able to jump in like you did. What canning cookbooks did you use?